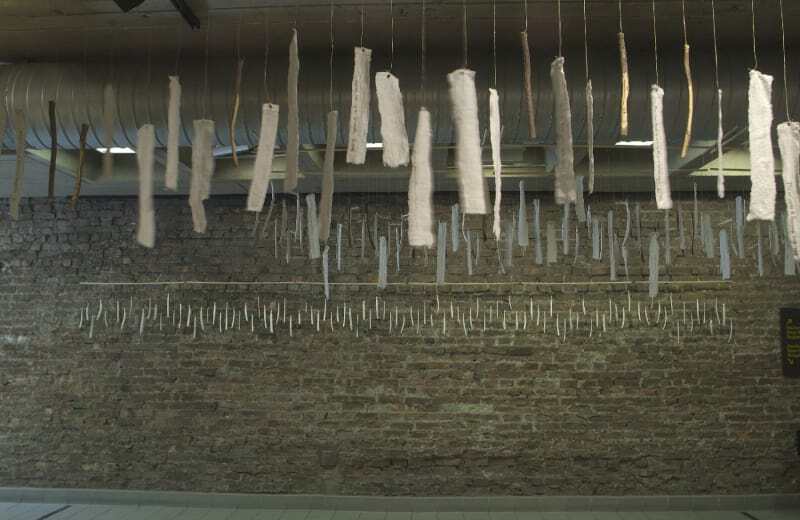 The “still lives” installation is hung to fill the gallery with individually named (dates noted where known) toothbrush-like forms, tooth rags, and chew sticks. The installation gives voice to the women among the first Jewish community in Nieuw Amsterdam and their female descendants buried in 3 small Manhattan cemeteries (Chatham Sq., West 11th and West 21st Streets, NYC, belonging to the Spanish-Portuguese Synagogue, a.k.a. Congregation Shearith Israel) through the mid-1800s. The women who died after 1779 (the year the Wisdom Factory in England opened to mass produce toothbrushes out of cow bones and horsehair) are represented by Dessel’s carved toothbrush-like forms. The women who died prior to 1780 are represented by linen tooth rags dipped in salt. The slave women and girls are represented by African chew sticks and named where documentations noted their names. Photographs of the tooth rags and chew sticks by Susan C. Dessel. Photographs of the “still lives” installation and the toothbrushes by Robert Puglisi.